The race for treasures in a moving maze! Since it first appeared more than 30 years ago, the successful game "Labyrinth" has grown into an illustrious family with numerous independent games in the series. And if you include all the foreign language versions as well, that means that over 60 versions of this hugely popular game have been created in Ravensburg. 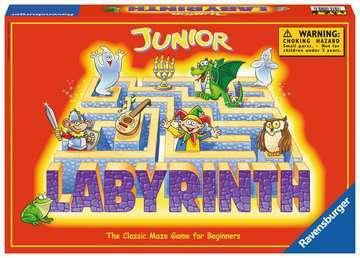 Labyrinth is considered to be THE classic Ravensburger game. This clever sliding path game with its unique game play, has been delighting players of all ages for generations, and never fails to lure the whole family to the table for a game or two. Playing is easy, just find the shortest route through the a-maze-ing Labyrinth and you'll be the winner. This game is designed for 2-4 players aged seven years and up, and the aim is to reach all your treasures and targets, using the shortest possible route through the Labyrinth. But there's a twist; the structure of the Labyrinth can change at any time as players manipulate the route to either make a path easier for themselves, or block that of an opponent. The clever and unique game play ensures an even playing field for players of all ages; so young children, teenagers, parents and grandparents all have an equal chance to win. As the walls are constantly moving, no two games are ever the same, which means it is always exciting. The game board measures 36 x 36cm, and some of the wall tiles are already glued in place, ready to start. Before you start the game, place all the wall tiles on the board, filling in the spaces between the fixed wall tiles. It does not matter which tiles go where, it is all random. The treasure cards need to be distributed equally amongst the players, but these must be kept secret. Now place your wizard playing piece on the starting square of the same colour. Turn over your first treasure card, making sure no one else can see it, and start planning your route to the treasure. But don’t get too relaxed, by the time it is your turn, the walls might have moved, and you will have to choose a different path to your treasure. When it is your turn, pick up the extra wall tile, and insert it anywhere on the board where there is a yellow arrow. These yellow arrows indicate the rows and columns that will move when the tile is inserted. Once you have moved the walls of the Labyrinth, you will hopefully have a clear path to your treasure. If not, move your wizard playing piece to as close to your treasure as you can get, and wait for your next turn. Play continues until the first player has collected all his treasures. Sometimes the moves other players make to get to their treasures will help you, and other times you will find your playing piece being pushed off the board. Either way, Labyrinth is great fun, and always exciting! An award-winning game of a little strategy and a lot of luck, perfect for the whole family!